And to celebrate, and because it turns out I’m not the only one who loves them, I’ve drawn some bats! A little brown bat, because those are the ones that you mostly spot in the skies around here, fluttering against the summer twilight like determined black butterflies. And an Egyptian fruit bat, because they’re so objectively cute that I think even your average chiroptophobe has to find them endearing. Happy October everyone! 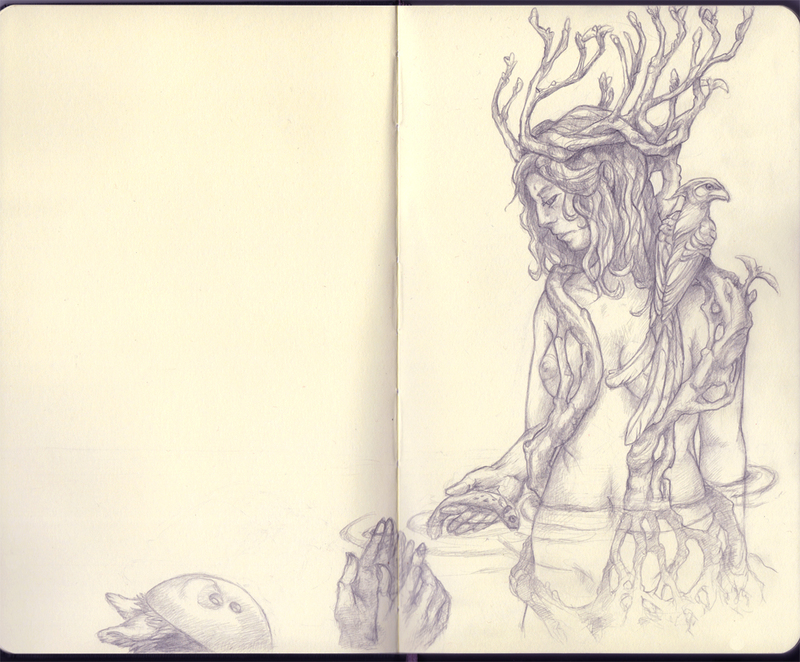 A sketchbook spread using the idea of ‘beauty and the beast’ as a stepping off point. I’m working on a number of things that can’t really be shared until the projects launch, so this is all I have to show for myself at the moment. Enjoy? Beside bones, the Natural History Museum has tons of taxidermy animals. Visitors often talk about these animals with their kids as if they’re alive, at the zoo. I overheard a lot of these conversations… Kids asking what the animals were doing, or insisting that the okapi was either a zebra or a giraffe (?? ), or adults claiming that they could take that bear on. It was interesting, too, the sort of people who’d stop and talk to me. In the Natural History Museum it was almost exclusively kids, and one teenager, who’d want to shyly complement me, or ask me questions about my technique. In the National Gallery, it was exclusively older men, also wanting either to complement me or nervously ask if it was ok for them to photograph whatever painting I was sketching from at the time. Interesting, and I’m curious to see whether my experience is much different when tourist season’ over. I took notes on the name of what I was sketching from, but my handwriting is atrocious. If you’re having trouble reading it, let me know and I’ll transcribe. The rest after the cut! And the AC has already broken twice this season, both times on the hottest stretches of the week. This time, it was three days of no air conditioning + heat index of 105*F = lying on the couch beneath a ceiling fan drinking water and feeling miserable. Occasionally I got up and changed the cats’ water, or attempted to bathe them so they’d be a tiny bit less miserable themselves, but that was about it. Oh, I managed one sketch in my moleskine. Thanks for not bringing the fire 'round, dragon. Looks nice and cool in that lake. Summer is not my favorite season. More art and sketches soon, now that the AC is trundling along again. Evan just published a new post on his blog, with some illustrations he’s done for the upcoming 20Spec anthology. Gorgeous ink drawings, check them out! This reminded me that it’s been a while since I last blogged, or uploaded art, or anything. My only excuse is that I’ve been working on a number of projects lately (one that is truly awesome, for a client!) some of which are stories rather than art and most of which are nowhere near done. Then there were the past few days, where we had temperatures in the high 80’s and low 90’s, with a a heat index of 100*F+, but no air conditioning. 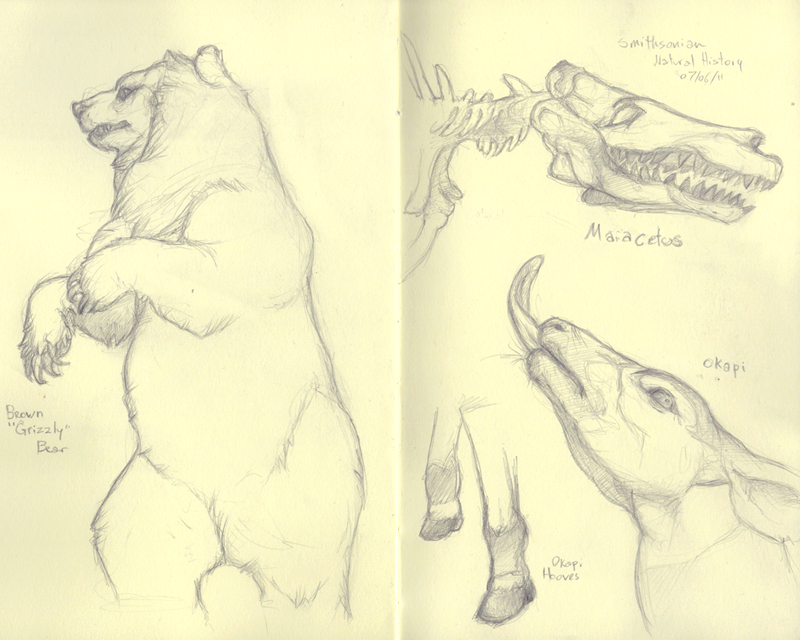 I didn’t really get much done besides showering a lot and making desultory pencil sketches in my moleskines. Speaking of moleskines, I recently rediscovered the site ‘Skine Art. If you haven’t seen this before, I heartily suggest you take a look. Extremely inspiring to me, and a provider of the impetus to work in my sketchbook every single day. Also the best advertising for moleskine brand ever, I so want to be a part of that community every time I go there. X) Actually, I finally am. The above image might be appearing there sometime in the next few days. Some great artists I’ve discovered since my last blog post! Xiao Han’s entire portfolio is full of gorgeous, subtle illustrations, but I particularly love these little watercolors. I want to try this technique myself. And Joseph R. Tomlinson is someone I found on ‘Skine Art, because his sketches are dynamite. I love his chickens the best. Also, illustrator Eric Orchard is excellent in general, but you should especially check out his recent ‘Comic Book Tools and Materials’ series of blog posts (sadly he hasn’t given them their own tag, so I can’t link directly. They’re easily locatable on his blog, I promise!) Very good, very detailed advice. (Though not all of them might be safe for your workplace… I try to warn you in the ALT text).